Recorded at Mountain Studios in Montreux between July and September 1981 and at Musicland Studios in Munich between 6 and 22 December 1981 and from 23 January to March 1982. Further recording were made at The Power Station and Atlantic Tower in New York City without Queen. 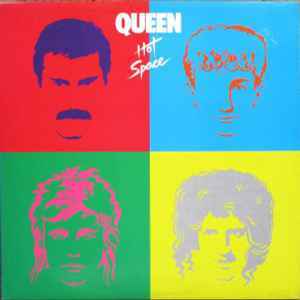 This grouping gathers together all versions of the "Hot Space" album, originally released in 1982 on vinyl and tape, as well as subsequent reissues and bootleg versions. Officially, the entire back catalogue was re-issued for the first time on CD by EMI in 1986, and again on CD/tape in remastered form in 1991 for the US market (via Hollywood Records and adding a few non-album tracks or remixes not included on the original versions). Parlophone also re-issued the remastered versions in 1993/1994, and subsequently several additional re-remastered versions have appeared. In 2009, the entire back catalogue of studio albums (now remastered) was re-released again, this time on heavyweight vinyl. "40th Anniversary" CD versions appeared in 2011 in standard and "Deluxe Edition" (the latter including a 2nd disc with bonus tracks) via Island Records. Was this only made available in Southern european countries, as I just ordered one but it is all in Spanish? Is David Bowie actually credited as a performer on track B6? I see him with a writing credit and production credit but, no performance credit. At least not on the copies I own. Should he really be listed as a main artist in the tracklist? This listing shows a Columbia House record club lp. Not a regular retail copy that should be posted on this page. The Columbia House record club issue image should be on a listing for the Columbia House record club release. This listing shows a Columbia House record club cassette. Not a regular retail copy that should be posted on this page. The Columbia House record club issue image should be on a listing for the Columbia House record club release. I have the USA promo + press kit.